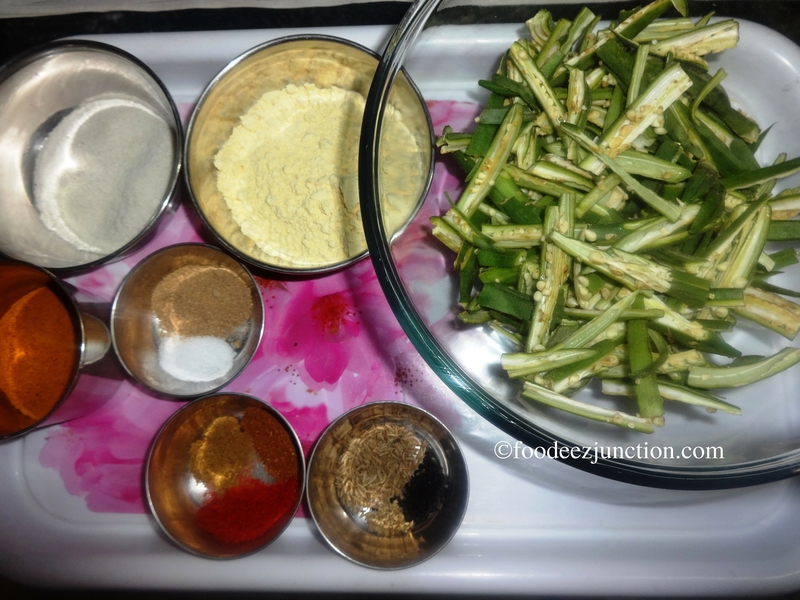 Bhindi fry recipe makes such a yummy and crispy okras! Even if you don’t like this vegetable, you would want to eat kurkuri bhindi fry. Bhindi is known by various names. Bendi (pronounced as bhendi), Bendakaya, Ladies Finger, Okra, Vendakkai. Whatever the name be, it’s one of those vegetables which can be made with different Indian cooking styles. 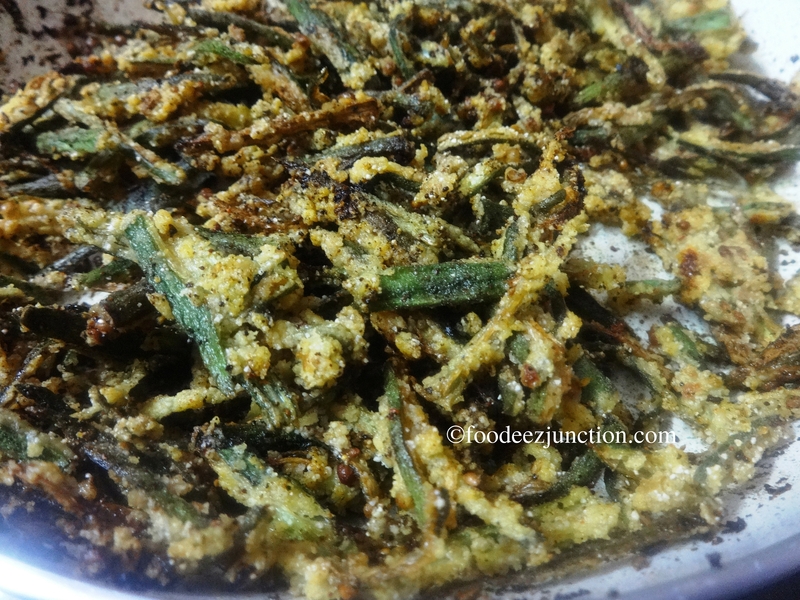 I can have a bowl full of bhindi fry in snacks; its texture is just like chips. I, recently, got to know that there are many people who doesn’t like this vegetable. I don’t know the reason but I’m giving you a reason to try it once with this Kurkuri Bhindi Fry Recipe. A foodie friend asked me to share the recipe. So here is this crispy okra recipe. It can be made within 30 minutes. All you need to do for preparation is – cut the bhindi and spread it on a tissue towel for five to six hours and then make it with the below given recipe. The plus point is – you need not chop any other vegetable like onion or tomatoes and sweat in this soaring temperature. Let’s start with the cutting of the ladies finger. There is a style to cut the bhindi to make this vegetarian food. Cut off the top and end of the ladies finger; take one at a time. Cut it into two equal halves. Take 1 half and cut it vertically. Now, again cut this portion, into 3 vertical pieces. Repeat for the other half. Repeat the same process to cut the rest of the ladies finger or okra. Time taken: 30 minutes; serves 3 people. Take a mixing bowl, put chopped bhindi in it. Now, add rice flour and besan to it. Mix well using fingers. Add 1 tsp of refined or olive oil and again mix well. 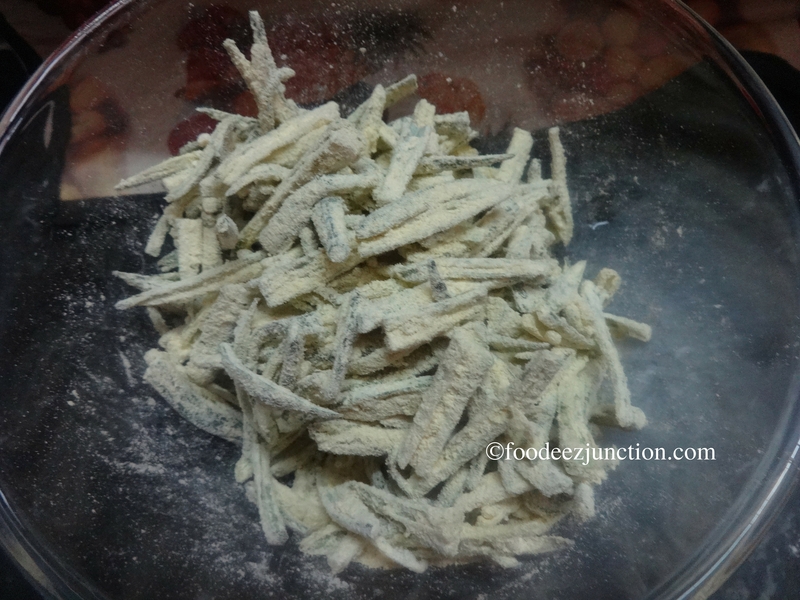 Do not mix the flour and salt and keep the Bhindi mix to wait for more than 5 minutes. The ladies fingers will start getting moist. Pour oil in a dried wok or kadhai and heat it on high flame. Now add salt to taste or 1/2 tsp to the bhindi and mix well again. By this time the oil will be hot enough for frying. Fry bhindi mix in two sittings; don’t overcrowd. Fry it on a high flame for at least 5 minutes but don’t let the okras get burnt. Take it out on a clean tissue towel and spread it. Now fry the rest of the bhindi mix. Keep the fried okras aside. Take a frying pan, add 2 teaspoons of refined oil and heat it. Add zeera, ajwain and kalonji to the hot oil and let it splutter for 10 seconds. Now add all the spices – cumin powder, garam masala, haldi, red chilli powder and amchur. Heat it for 20 seconds and turn the flame off. Immediately add the fried okras to the pan and mix them with the masala quickly. You need to do this step quickly else the masala or spices can get burnt. Mix well. Garnish the Kurkuri bhindi fry with chat masala, black pepper powder and sesame seeds. Have it with dal, roti and rice or chawal. Sesame seeds is completely optional. I didn’t garnished with sesame seeds.